Scans, Previews & Converts Mailbox emails, calendar data, tasks, journals, etc. Allows you to Create Singular PST file or Split data file by size. 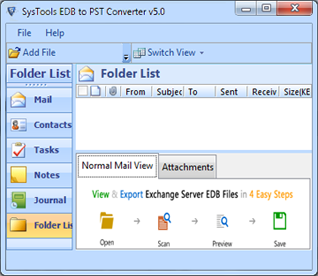 Exchange Server EDB to PST Converter software transforms Exchange Server mailbox database to Outlook PST file. Exchange Mailbox Converter allows users create an individual UNICODE PST file for each Mailbox Database. This tool help users to Extract Exchange Database to PST file format with surety. Exchange Database often carry bulk of user data which creates manageability issue while converting Exchange Database to PST file format. Exchange Email Converter ensures that the PST files gets split according to size as per user convenience. By this way EDB Extract tool can help users to share PST files easily. EDB Extractor tool allows users to export complete Server Mailbox database items such as contacts, calendars, journals, tasks, etc. from Exchange Mailbox to PST file format. By using this tool, user can access converted PST file into Outlook. EDB Email Extractor tool converts complete Exchange mailbox database to PST and also helps to convert Private folder (priv.edb) & Public folder (pub.edb) databases to Outlook data file format. The tool to convert Email from EDB file to PST, migrate both folder's data into a single PST file. EDB to PST Conversion tool ensures that the extracted File preserve complete email integrity. While Exporting email database, it ensures that proper folder hierarchy is prevailed within the converted PST files. Exchange Mailbox Conversion would be therefore more manageable while performing bulk database conversion to PST. This Software provides multiple export options such as select folders to export, split PST file by size & select destination path respectively. EDB Extractor tool also features ignoring system folder database i.e. Windows.EDB which are usually windows indexing files and are treated as false positives with irrelevant information. To Perform Exchange Mailbox to PST conversion, it is necessary to exclude crucial documents from the heap of others. Exchange Email Converter supports recovery and conversion from a damaged or corrupted Exchange database EDB file. It Scans, Recovers & Previews Damaged Exchange EDB & STM file further allows to convert & extract the recovered files to Outlook PST. This Software is able to scan and extract dismounted database from all the versions of Exchange Server. Users can perform extraction of Exchange 2013, 2010, 2007, 2003, 2000 (32 & 64-bit) version database to Outlook PST & Office 365 email profile without any hassles. Exchange Server stands amongst the highly trusted Email Server & Personal Information Management Server for corporate, enterprise, business and home users. To manage personal information and email repository, Exchange Server stores complete information in EDB (Exchange Database File) Format along with transaction logs. Server Failure leading to damaged or corrupted Exchange Database thus necessitating user to extract complete dismounted Server data into MS Outlook PST (Personal Storage Table) File. Extensible Storage Engine (Jet Errors) prompting database corruption or inaccessibility. Access Public or Public Folder Email data from a dismounted Exchange Server database. Outlook PST file format suites the need here aptly for quicker data access. Migration from older to newer Exchange Server or to access data outside the Server. Management of Oversized Exchange Server backup database by migrating user email data to MS Outlook. To Analyze Dismounted Exchange database from a compromised Server for investigation purposes, where Outlook serves as a better platform to perform the same. Exchange Server however offers multiple ways to convert Exchange Mailbox to PST with PowerShell commands and simple copying the mailbox data. But restrictions such as Exchange Server should be live & in a running state and complexity prevail jeopardizing whole process. To overcome such scenarios, utilities such as EmailDoctor Exchange Server EDB to PST Converter & extractor serves the purpose proficiently. User can easily convert exchange mailbox into Outlook PST in just a few clicks of button. Why Prefer Exchange Server .EDB Database to PST Extractor? This Software is designed and developed to curtail issues related Exchange Server to Outlook Data file conversation without any hassles. Exchange Mailbox to PST comes packed with multiple features designed to deal with the issues and perform conversion precisely. Migration of Exchange User Mailbox requires huge precision and accuracy which is delivered by the Exchange Database to PST Conversion utility without compromising. This tool help users to extract into PST without losing any Email data or any other data stored in EDB file. Our organization had recently decided to migrate our dedicated Email Server within a limited amount of time. Foreseeing the scarcity of older data availability, our technical team decided to extract Exchange Server Database to PST so that user mailboxes could be accessed using MS outlook. Thanks to Exchange EDB to PST converter, it was possible without facing any issues as such. Does this software require live Exchange Server mailbox connectivity while performing extraction? No, Exchange Server Mailbox Recovery utility does not require live Exchange Server environment. The tool proficiently exports dismounted Exchange Server database to Outlook PST file format. Does EmailDoctor perform Exchange EDB file to PST conversion without Outlook installation? Exchange Email Converter requires MS Outlook (32-bit or 64-bit version) preinstalled on the conversion machine. The machine requires pre-configured/dummy POP3 profile which is not linked with MS Exchange Server. My EDB file is password protected can I still convert it to PST? Yes, Exchange Mailbox converter is able to access password protected dismounted Exchange Server database EDB file, preview and convert it to Outlook PST respectively. Stranded with a damaged Exchange Server, our team was facing the worst times of database unavailability. Fortunately with EmailDoctor's solution to convert dismounted Exchange EDB file to PST, we were able to regain crucial data and cope with the Server downtime smoothly. Investigating a complete dismounted Exchange Server database is a quite tedious task to perform. However extraction of Exchange Mailbox to PST and then analyzing individual email data using MS Outlook was the approach we were aiming for. Exchange EDB to PST Converter proved to be an amazing tool to perform this quickly and serve the need proficiently. Facing complicated situation of terabytes of Exchange Server database management, conversion of dismounted Exchange EDB file to PST was only the viable solution offered to us. Using the tool, we were able to convert and split Gigabytes of Personal Exchange Mailboxes without tampering the integrity of Data. Dealing with extraction & analysis of confidential user data from bulk Exchange EDB files required a smarter approach than manually figuring them out. Using Exchange Server EDB to PST conversion utility, the process complexity was reduced to a manageable extent. Kudos EmailDoctor team! !.